Prime Minister Narendra Modi dedicating various development projects to the nation, at Chansari in Guwahati on Saturday. Prime Minister Narendra Modi on Saturday kick-started projects to the tune of Rs 18,000 crore at a public rally held at Changsari in Guwahati. 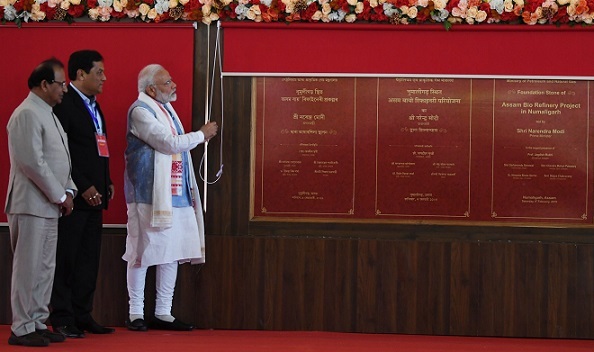 Prime Minister Modi laid the foundation stone and unleashed the plaques of the projects namely Bio Refinery at Numaligarh, North East Gas Grid, Barauni-Guwahati Natural Gas Pipeline, Bridge over river Brahmaputra connecting Guwahati with North Guwahati at Changsari on Saturday. While laying foundation stone of the projects, Modi said the development initiatives launched by the NDA government has been successful in touching the lives of people of every corner of the country. He said the Union government’s commitment towards the region has already been reflected in the interim budget which has increased allocation for Northeast by 21 per cent. Stating that efforts are on to strengthen economy of the Northeast, the PM said as a result of proactive steps of the NDA government, many long pending projects like Bogibeel Bridge, Bhupen Hazarika Setu connecting Dhola-Sadiya and many other projects were dedicated to the service of the nation. He further informed that already projects worth Rs. 14,000 crore has been completed in oil and natural gas sector apart from ongoing projects to the tune of Rs. 9500 crore. Moreover saying that the proposed Bio Refinery at Numaligarh is the largest amongst the 12 bio-refineries in India, he informed that this would generate additional income for around 50,000 families. He also said projects like North East Gas Grid, Barauni-Guwahati Natural Gas Pipeline, Bridge over River Brahmaputra connecting Guwahati with North Guwahati would revolutionise development narratives in the State. Assam Chief Minister Sarbananda Sonowal while speaking on the occasion thanked Prime Minister Narendra Modi for conferring Dr. Bhupen Hazarika with the highest civilian award Bharat Ratna. He also said the Centre under the leadership of Prime Minister has taken several visionary projects for infrastructural and economic development of the State. Terming the day as historic in the growth narrative of the State, Sonowal said never before in the history of the State such massive investment was pumped in on a single day. He also thanked Prime Minister for investing Rs. 22,594 for capacity augmentation of the NRL. The Assam CM said it is because of Prime Minister Modi the implementation of the clauses of Assam Accord has been initiated in right earnest. For the detecting illegal foreigners, NRC exercise was initiated in right earnest along with sealing of Indo-Bangla border, he claimed. He also stated that State government has plunged in action of forming a Bor Asom taking all communities and ethnicities along. He also claimed the presence of ethnic leaders representing all Autonomous Councils in the function at Changsari is the “testimony of the government’s commitment to embrace an inclusive society”. Allaying all fear-psychosis, Sonowal, however, said the government would do everything to safeguard interests, rights and privileges of indigenous communities of the State. Bhoomi Pujan for the All India Institute of Medical Sciences (AIIMS) to be constructed at Changsari was also held on Saturday. Assam BJP president Ranjeet Dass, Health minister Himanta Biswa Sarma also spoke on the occasion. Union Minister of State for Railways Rajen Gohain, several MPs, ministers, Chief Executive Members of Autonomous Councils and a host of other dignitaries were present on the occasion.